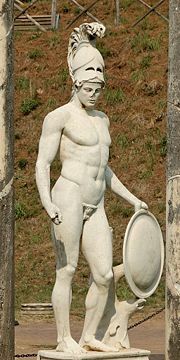 Statue of Ares in Hadrian's Villa. In Greek mythology, Ares, the Olympian god of war, was the son of Zeus (king of the gods) and Hera. Among the Greeks, Ares was always mistrusted for he was seen as an erratic god of savage slaughter and bloodlust. His birthplace and mythological home was far off, among the barbarous and warlike Thracians (Iliad 13.301; Ovid), and, according to lore, Ares withdrew to Thrace after he was discovered on a couch with Aphrodite (Odyssey 8.361). Though Ares' half-sister Athena was also considered to be a war deity, Athena's stance was that of strategic warfare while Ares' tended to be associated with the unpredictable violence of war. The Romans equated Mars, the Roman god of war (whom they had inherited from the Etruscans), with Hellenic Ares, but between them, Mars stood in much higher esteem. Among the gods, Ares was recognized by his brazen armor and spear that he brandished in battle. Further, Ares had a chariot drawn by four gold-bridled fire-breathing immortal stallions (Iliad v.352). His sacred birds were the barn owl, woodpecker, the eagle owl, and the vulture. According to Argonautica (ii.382ff and 1031ff; Hyginus, Fabulae 30) the birds of Ares were a flock of darting birds that guarded the god's shrine on a coastal island in the Black Sea. In Sparta, the chthonic night-time sacrifice of a puppy to Enyalios became part of the cult of Ares. In later Renaissance and Neoclassical works of art, Ares' symbols were a spear and helmet, his animal was the dog, and his bird, the vulture. In literary works of these eras, Ares appeared as a cruel, aggressive, and blood-thirsty god, reviled by both gods and humans, much as he was in the ancient Greek myths. Deimos and Phobos were his children by Aphrodite and were the spirit of terror and fear. The sister and companion of murderous Ares was Enyo, goddess of bloodshed and violence. The presence of Ares was accompanied by Kydoimos, the demon of the din of battle, as well as the Makhai (Battles), the Hysminai (Manslaughters), Polemos (a minor spirit of war; probably an epithet of Ares, as he had no specific dominion), and Polemos' daughter, Alala, goddess/personification of the Greek war-cry, whose name Ares used as his own war-cry. There are accounts of another son of Ares, Cycnus (Kýknos) of Macedonia, who was so murderous that he attempted to build a temple with the skulls and the bones of travelers (Greek Lyric III Stesichorus, Frag 207). Heracles slaughtered this abominable monstrosity, engendering the wrath of Ares, whom the hero wounded (Apollodorus 2.114). Although important in poetry, Ares was rarely worshipped in ancient Greece, except among the Spartans, where he was propitiated before battle. In Sparta, there was a statue of the god in chains, to show that the spirit of war and victory was never to leave the city; dogs and even humans were sacrificed to him (Apollod. Fragm. p. 1056, ed. Heyne). In the Iliad, Homer represented Ares as having no fixed allegiances nor respect for Themis, the right ordering of things: he promised Athena and Hera that he would fight on the side of the Achaeans, but Aphrodite was able to persuade Ares to side with the Trojans (Iliad V.699). During the war, Diomedes fought with Hector and saw Ares fighting on the Trojans' side. Diomedes called for his soldiers to fall back slowly. Hera, Ares's mother, saw his interference and asked Zeus, his father, for permission to drive Ares away from the battlefield. Hera encouraged Diomedes to attack Ares, so he threw a spear at Ares and his cries made Achaeans and Trojans alike tremble. Athena then drove the spear into Ares' body, making him bellow in pain and flea to Mt. Olympus, forcing the Trojans to fall back (XXI.391). Later when Zeus allows the gods to fight in the war again, Ares tries to fight Athena to avenge himself for his previous injury, but is once again badly injured when she tosses a huge boulder on him. In one archaic myth, related in the Iliad by the goddess Dione to her daughter Aphrodite, two chthonic giants, the Aloadae, Otus and Ephialtes, threw Ares into chains and put him in a bronze urn, where he remained for thirteen months, a lunar year. "And that would have been the end of Ares and his appetite for war, if the beautiful Eriboea, the young giants' stepmother, had not told Hermes what they had done," she related (Iliad 5.385–391). "In this one suspects a festival of license which is unleashed in the thirteenth month." Ares remained screaming and howling in the urn until Hermes rescued him and Artemis tricked the Aloadae into slaying each other. One of the many roles of Ares was in the founding of Thebes. Ares was the progenitor of the water-dragon slain by Cadmus, and hence the ancestor of the Spartans (the dragon's teeth were sown into the ground, and sprung up as the fully armored autochthonic Spartans). From the dragon's teeth, sown as if a crop, arose a race of fighting men, the descendents of Ares. To propitiate Ares, Cadmus took as a bride Harmonia, daughter of Ares' union with Aphrodite, thus harmonizing all strife and founding the city of Thebes. In the myth sung by the bard in the hall of Alcinous (Odyssey viii.300ff) the Sun-God, Helios, once spied Ares and Aphrodite enjoying each other secretly in the hall of Hephaestus and how he promptly reported the incident to Aphrodite's Olympian consort. Hephaestus contrived to catch the couple in the act, and so he fashioned a net with which to snare the illicit lovers. At the appropriate time, this net was sprung, and trapped Ares and Aphrodite locked in embrace. However, Hephaestus was not yet satisfied with his revenge and he invited the Olympian gods and goddesses to view the unfortunate pair. For the sake of modesty, the goddesses demurred, but the male gods went to witness the sight. Some commented on the beauty of Aphrodite, others remarked that they would eagerly trade places with Ares, but all mocked the two. Once the couple was unrestrained, Ares, embarrassed, sped away to his homeland, Thrace. In a much later interpolated detail, Ares put the youth Alectryon by his door to warn them of Helios' arrival, as Helios would tell Hephaestus of Aphrodite's infidelity if the two were discovered, but Alectryon fell asleep. Helios discovered the two and alerted Hephaestus. Ares was furious and turned Alectryon into a rooster, which now never forgets to announce the arrival of the sun in the morning. ↑ "You are the most hateful to me of the gods who hold Olympus," Zeus tells him in the Iliad ( 5.890); "forever strife is dear to you and wars and slaughter". ↑ The reading often remains ambiguous, as in a late sixth-century funerary inscription from Attica: "Stay and mourn at the tomb of dead Kroisos/ Whom raging Ares destroyed one day, fighting in the foremost ranks" (Athens, NM 3851) quoted in Andrew Stewart, One Hundred Greek Sculptors: Their Careers and Extant Works, Introduction: I. "The Sources"
↑ The temple to Ares in the agora of Athens that Pausanias saw in the second century C.E. had only been moved and rededicated there during the time of Augustus; in essence it was a Roman temple to Mars. The Areopagus, the "hill of Ares" where of Tarsus preached, is sited at some distance from the Acropolis; from archaic times it was a site of trials. Its connection with Ares, perhaps based on a false etymology, may be purely etiological. ↑ References to Ares' appearance in the Iliad are collected and quoted at www.theoi.com Retrieved April 13, 2007. ↑ Burkert (1985). Greek Religion, 169. Theoi Project, Ares Information on Ares from classical literature, images from Greek and Roman art. This page was last modified on 12 April 2016, at 15:41.